This is my final project during my BS in Electrical Engineering. The aim of this project is to implement a flight controller for UAV (Unmanned Aerial Vehicle) with 8 rotors configuration. This UAV is called as octocopter. Flight Controller is one component in octorotor that has responsibility to stabilize ocotorotor when flying. In flight controller there are two most important parts. Those are data acquisition system and attitude controller. 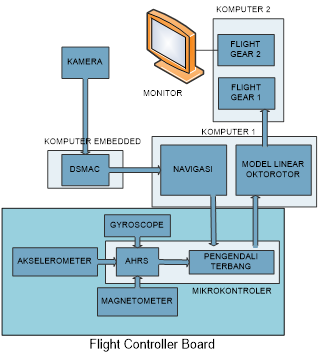 Data acquisition process in octocopter is called Attitude and Heading references System (AHRS). AHRS has responsibility to estimate the orientation of octocopter relative to the earth coordinate system. In the other hand, attitude controller function as the “brain” to process data from AHRS to become action/command to each of its rotor. This command must ensure that octorotor remain stable. In order to do that, attitude controller is equipped with an algorithm that implement feedback control system, in this project I used PID (Proportional Integral Derivative Control). Testing the flight controller is a big challenge, since the system itself is expensive. Thus, HILS (Hardware in the Loop Simulation) method is chosen. 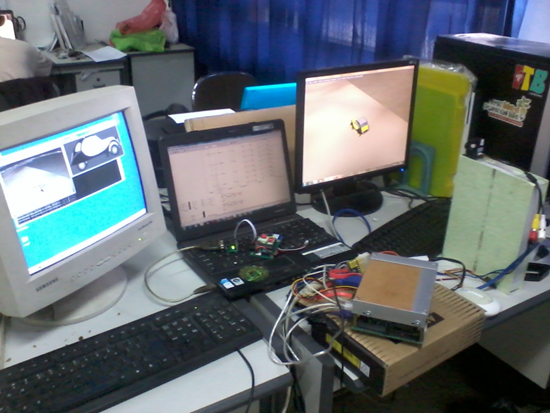 Flight Controller as the system under test is installed in a simulation setup consisting the mathematical model of octocopter and earth environment in MATLAB.